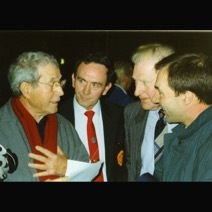 Dublin, January 1994. 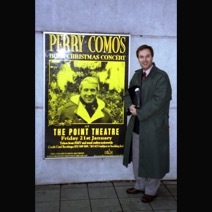 Perry Como was 81 years old, still performing and touring in the States, mainly around Christmas time. His annual Christmas show on TV had been something of an institution, both in the States and the UK, but it had been several years since his last show. Out of blue came the announcement towards the end of 1993 that Perry would be in Dublin in January 1994 to record a new show for transmission at Christmas 1994. The recording of the show would be done at a concert to be held at the Point Theatre in Dublin, during the last week of January. 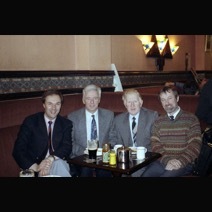 My dear friend, George O’Reilly, a Dubliner, arranged tickets for myself and my collector friends, Malcolm Macfarlane and Michael Crampton. But George had other plans too. He had spent his life working in the entertainment business in Ireland, and he was - still is - the living embodiment of the phrase “well connected”. George had plans to use his contacts to set up a surprise meeting for the three of us with Perry. When we arrived in Dublin, George insisted that we go for lunch to a hotel in the city centre. It was not George’s style and it was a suggestion that puzzled us. We were even more puzzled when, in the middle of lunch, George came back from taking a phone call and announced that “we have to go somewhere else”. His cover was blown. The hotel was where Perry had been staying all week and his routine and been to rehearse the show in the morning and come back there in the afternoon. George had already engineered a meeting for a couple of Irish fans earlier in the week. But today was the day of the recording and the rehearsals were over-running. The call to George was to say that Perry would be staying at the Point for the rest of the day. So, we hot-footed it over to the theatre and waited whilst George’s gift of the blarney got us inside, where we ran smack into Mickey Glass, Perry’s manager. Glass was exasperated - the rehearsals were way behind schedule and the last thing he wanted was anymore distractions. Too bad. 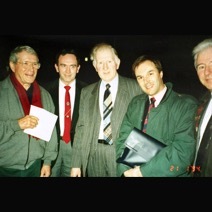 One of the support acts on the show as the Artane Boys Band and its leader, Joe Lynch, was a friend of George’s. Glass had told that us if we sat quietly in the stalls, we could watch the rehearsal but anything more, and we would be out. When a break was called, Joe gave George the signal and fortunately, we got to him and Perry before Mickey Glass did. 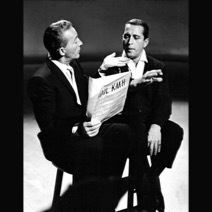 George was armed with two photos, one from when he had met Perry in London in 1960, and the other showing Perry with Bing Crosby, Perry’s mentor. Once he saw the photo of Bing, Perry was happy to stand and chat - you could see why the rehearsals were running late! He remembered the two shows he did with Bing - also in 1960 - better than anything else he had ever done, he said. “During one of the medleys”, he said, “I stopped the show and said ‘You know if it wasn’t for him, I’d still be cutting hair’. Bing, said Perry, had not liked the comment. Crosby was a complex man, much shyer and reserved than his public image, and he did not deal well with any direct shows of emotion. “Don’t ever do that again,” he had said to Como after the taping was over, and, said Perry “you knew he meant it”. It was a lovely encounter. 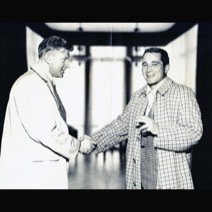 I remember Perry’s gentle smile, his handshake - his hands were as soft as if he was wearing the finest set of leather gloves - his eye contact and his interest in us. A lovely man. Sadly, the show later that night was his last hurrah. Combining a TV recording with a theatre concert was a step too far. What’s more, coming from Florida to Dublin in January meant that Perry had caught a cold and as the evening wore on, his voice deteriorated. There was a moment of high drama when, after the interval, it was announced that Perry was unwell and would not be able to continue, only for him to return to the stage 30 minutes later and produce two stunning renditions of “And I Love You So” and “The Wind Beneath My Wings”. The audience in the Point was on its feet, cheering like a football crowd. A memorable day! Image gallery shows (1&2) Perry, Joe Lynch, George O’Reilly, Ken Crossland & Malcolm Macfarlane; (3) George with Perry, 1960 (the photo that opened the door for us! ), (4) Perry and Bing on TV, 1960, (5&6) Ken, Malcolm, George, Michael Crampton enjoy a pint of Guiness and reflect on the afternoon.